It’s 10°F this morning, and there’s ice on the inside of the windows. First thing I did? Go out and check on the chickens. Who were out in their yard apparently as happy as ever. I took them a big pot of hot water since their regular water dispenser was frozen solid. And I threw them a week-old head of lettuce, which elicited its usual warbles of thanks. Now back inside, I turn to my writing desk, and for inspiration pull out one of my favorite short stories: “A Jonquil for Mary Penn” by Wendell Berry. Turns out it’s the perfect tale for a day like today, when it’s bitterly cold and so many people are dealing with colds and flu. I heartily recommend it, and will get you started with the first paragraph. 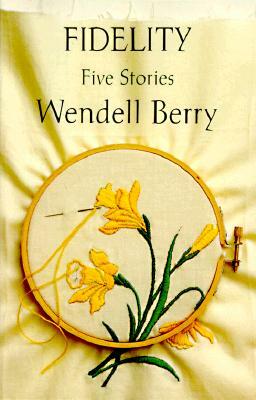 The rest can be found in Berry’s short story collection Fidelity. Mary Penn was sick, though she said nothing about it when she heard Elton get up and light the lamp and renew the fires. He dressed and went out with the lantern to milk and feed and harness the team. It was early March, and she could hear the wind blowing, rattling things. She threw the covers off and sat up on the side of the bed, feeling as she did how easy it would be to let her head lean down again onto her knees. But she got up, put on her dress and sweater, and went to the kitchen. I like the quote about the week-old head of lettuce and how much joy it brought your chickens — what if humans were to appreciate the “simple pleasures” with the same zeal? I am impressed by your chickens’ resilience!!! So am I! We’ve hit another cold spell this week, and the only difference it seems to make to them is that they tend to stay in the coop out of the wind and stand on one leg at a time (to keep the other warm, I imagine!). Now I really get the comment you made on my blog about chickens. 10°F! It was no idle boast. Haha. 🙂 No, it wasn’t. I’ve got a few chickens who can be quite mean to the others. If they’re also the most productive (I don’t keep close enough tabs on them to know), then I can definitely see the case for not breeding exclusively for productivity!